Sega's Turbo OutRun (arcade) section 1 (stages 1 - 4) completed on MAME. 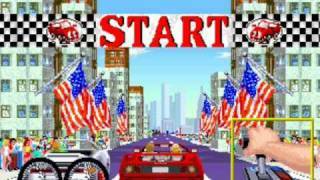 http:www.longplays.orgPlayed by ScHlAuChiA nice update of the original Out Run! http:www.longplays.orgPlayed by MadMattyA shortplay again. One of the easiest ports of the game. Try not to crash and youll make it. let go of accelerator every now and again on a tight corner and tyou should make it through. Only annoyance is the slow ai cars, just endup in a crash fest ;)I actually prefure the C64 port of the game though. Just seems like there was more effort put into the port and presentation of the game.